Cimarron Custom Leather Handbags is 3-year-old company, founded by Susan Kellogg of South Glens Falls, New York. Susan grew up one of six children with a seamstress mother. From her mother, she picked up the ability to sew and she grew up sewing her own clothes and even won prizes at local fairs for some of her work when she was a child. Susan studied Design at LIU at Southampton. At this point in her life, Susan took a break from sewing and pursued other interests and opportunities. A few years ago, Susan’s husband, Phil, recruited her help in sewing for his upholstery furniture business. This reinvigorated Susan’s interest in sewing and her talents for it. Around this time, she attended a trade show in Las Vegas and there, she purchased a leather handbag. This purchase further spurred her to start designing and producing small-run leather handbags and accessories. Susan and her husband started looking for sources for leather. They found Townsend Leather in their own backyard – approximately 40 minutes away. They knew Townsend was located in an area well-known for its rich heritage of leather-making. Upon their first visits to Townsend, she found a lot of different styles, colors, and patterns of leather that would be used in her first handbag designs. Over the coming months, Susan formally established her business as she began to produce leather handbags and word-of-mouth spread and orders started coming in. She named her business after her prized horse, Cimarron, who itself was named for the Cimarron Valley in New Mexico. Susan’s love for the West is obvious in some of her designs. She has incorporated conchos and horse bits as embellishments to many of pieces. The equestrian customer base she has established has come to love Susan’s work because of these details. Cimarron Custom Leather Handbags started to grow over the months both by word-of-mouth and by its participation in a wide-range of trade shows all over the country and presence in boutique stores in different locations. Susan’s target customer ranges in age from 25 – 65 and is, of course, largely female. What connects Susan’s customers to her pieces is a blend of the leathers used, the beautiful designs and combinations of materials, and the lightweight quality of her handbags. Susan doesn’t use stiffeners in her bags to keep them lightweight and easy to carry. Susan has different styles for different customers and geographic regions. Some customers tend to go for the trendier options – bags incorporating acid wash hair-on hides and foils, for instance, while others opt for more classic and traditional designs and colors that can be used from year to year. Susan has options for everyone and works hard to stay in front of the customer with new ideas, color trends, and options. Susan’s customers love the Townsend Leather used on these bags. They demand the full aniline drum-dyed leather Townsend makes and recognizes that the best leather is dyed all the way through from top to bottom. The customers love the softness of the leathers Susan selects, especially the lambskin she incorporates into many of her products. And they love the fact that Susan is making these handbags and accessories in Upstate New York, USA, with leather that is produced a short-driving distance from her shop. In the short 3 years since Cimarron Custom Leather Handbags has started doing business, Susan has seen tremendous growth. Her product line has grown to more than a dozen options, including not just bags now but also accessories such as bracelets and belts. Susan takes feedback and ideas for new products she receives from speaking to customers very seriously, and she quickly incorporates new ideas into her line on a regular basis. Because of this growth and increase in orders, Susan has already had to relocate her workshop from the original location to a new one that is larger and can better accommodate the daily orders and work. Susan often stays up until 11:00 PM working on catching up on the orders she takes in. Susan’s sister, Debbie Braley, also works full time with her sewing and doing design work. The sisters say they have more ideas for leather bags and accessories than they can keep up with at this point. Susan says when she comes to Townsend to shop for leathers, it’s like Christmas to her with all the leather options available to her. She looks forward to continued growth in her business and to using more and more of Townsend’s innovative leathers in her future designs. 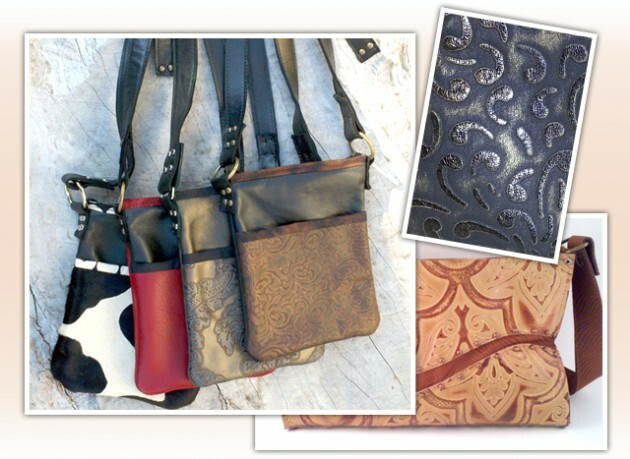 To learn more about Susan and Cimarron Custom Leather Handbags, please visit www.cimarronhandbags.com.